This is how it turned out. I want the model to be at the state as when they where setting the main top mast (if thats the correct word). I am pretty sure that is the correct English word for this action. And very nice work Matti. Your whole model has a very authentic look to it, and I like the idea of displaying a half way set/struck topmast. looks very interesting but I hope you know how you will proceed with the rest of the rigging of the mast. This could be a little bit tricky. Do you have a template? Alex,thanks, I'm supposing it would look like this during the first assembly of the real mast. We have plenty of other details that show similar changes during the building and rigging process. For example, the mastheads are outfitted with Dutch-style caps, which are rounded to allow the halliard ties to pass over them, but in fact the ties go through sheaves in the sides of the mast below the trestletrees. Did you follow up on the Scottish connection here? I have since found other interesting examples. There is a votive ship, for example, in Dalarö church with pretty much original rigging from around 1650 (seemingly portraying a ship that is a couple of decades earlier still). It has mast caps with rounded top and back, but angular front. 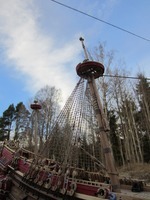 The ties go through the sides of the mast below the trestle trees on this one too. Are there any grooves across the Vasa mast caps for the ropes? Could it be that the rounded shape is just a shape like any other and there was never any intent to take the ties over the cap in the dutch way? Wasn't the Vasa fore mast reused from a different ship, but still shows the same arrangement? Shows Olof Pipping and Fred Hocker with a rather large functional rigging model. 1. Note how the shrouds do not rest on the trestle trees, but at a point higher on the mast, where the mast has a kind of shoulder and changes from square to circular. 2. The toprope is rigged and goes inside the trestle trees. 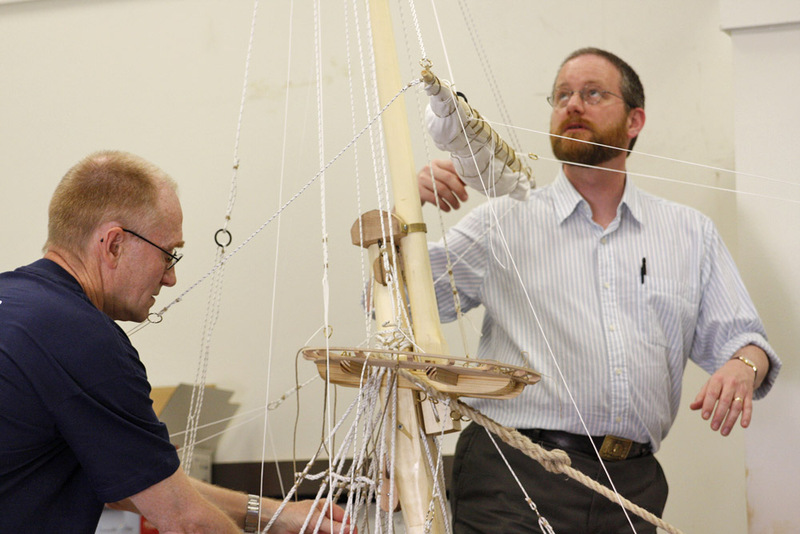 The model that Olof and I used at Texas A&M is rigged to allow it to be moved and operated by students, and so should not be taken as a detailed guide to the actual rigging of the ship (there are no blocks, for example). The mainmast cap, which is original, has no grooves in the upper surface, since it did not have to carry the halliard tye. There were a pair of iron reinforcing straps for the eyebolts which carried the toprope. In ships which had the tye led over the cap, the ironwork was let into the wood so as not to offer a chafing problem. The shrouds do not rest directly on the trestletrees but on a small rounded bolster which sits on the trestletrees - this was a typical arrangement at the time, as far as we can tell from other sources. It provides a fairer lead for the shrouds and reduces chafe. 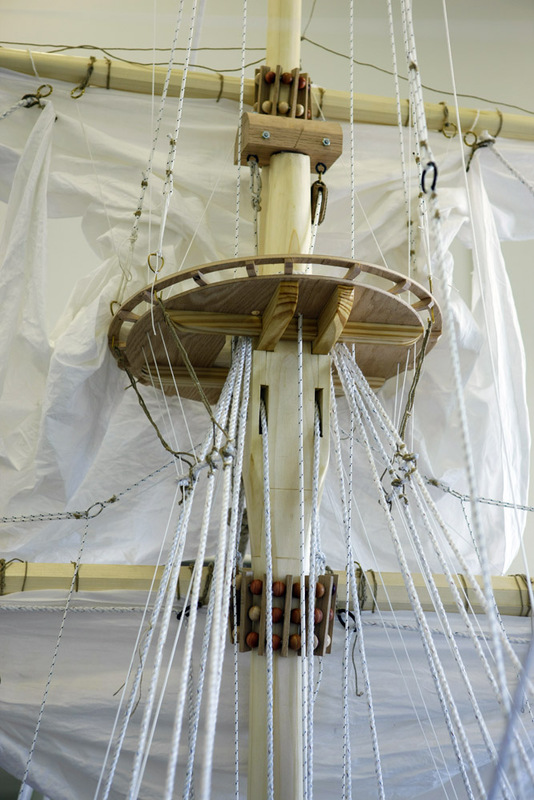 The toprope was normally rigged at all times, since setting and striking the topmasts was a regular part of sailing operations in the 17th century. With regards to the shrouds and their resting (load point), have you seen the article by Sam Svensson in Mariners Mirror XLVIII p128-133(1962) titled "A Seventeenth Century Masthead"? He was making the point that in Swedish mast head design (which he makes an argument of historical evolution stemming back to viking masts) is not to let the trestle trees take the load of the shrouds at all, only the weight of the topmast. Several indicators seem to point at Swedish rigging practise in the 17th century putting the load of the shrouds on a shoulder above the trestle trees. 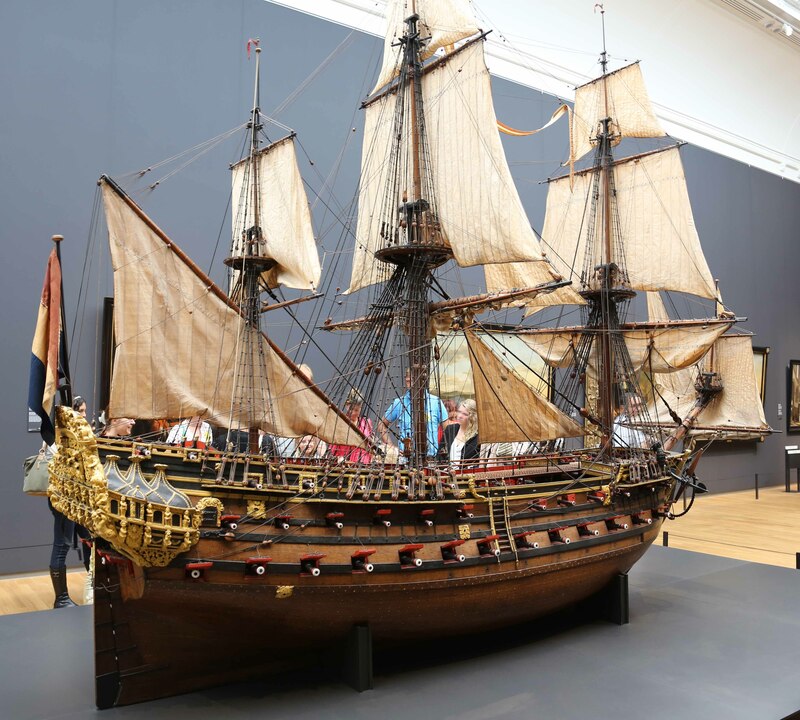 As archeological examples, he takes the fore mast of Gröne Jägaren (1652) recovered in 1953 and the main mast of the Vasa, of which he says "About 18 in. above the trestle-trees the mast head is rounded forming a shoulder for the eyes of the rigging, which does not rest on the trestle-trees." He also studied several 17th century votive ships, which seems to agree. He also found it interesting that literature does not agree(pg 130), but usually put forward the well known method of resting the shroud -protected by the bolster- on the trestle-tree. I found this very interesting and would like to hear your opinion? 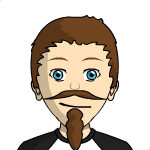 Last Edit: Aug 26, 2015 22:39:35 GMT by Peter Jenssen: Forgot closing quote, added literature discrepancy observation by Sam Svensson and literature source cause speculation by myself.. I like Svensson's article, although I am not sure that the evidence is conclusive. The shoulder on the foremast and mainmast of Vasa, where it goes from round to square above the trestletrees, is not very substantial, just the beginning of a chamfer really, but it does coincide with the upper edge of the bolster. The load of the shrouds effectively passes through the trestletrees to the hounds, which are part of the mast itself, so the distinction Svensson proposed is, to a certain degree, academic - the mast takes the load one way or another, and the load on the trestletree is a simple compression load. I think that the particular construction of Vasa's mainmast is set up to handle the issue of the extreme angle between the mast and the trestetrees. An angled bolster matched to the beginning of the chamfers that take the mast from square to round allows the shrouds to sit squarely over the mast, rather than at an angle. If you look at the drawing below, where the top of the trestletree and the top of the bolster are marked, you can see that the shoulder Svensson mentions is only a short distance above the trestletree. Its shape, combined with the known diameter of the shrouds, would also tend to concentrate the compression load on the lowest shroud pair (actually the mast tackles) on two sharp points, which would encourage chafe. A bolster is necessary here, and there is plenty of evidence for its inclusion - this is how we have rigged the masts after they were restepped. Interestingly shaped angled bolster there. Svensson mentioned 18 inches distance between the shoulder and the trestle-tree. That would be at the wide end of the bolster I suppose? The 'shoulder' on the Vasa mast, (even as he draws it) is not as pronounced as his other examples. Perhaps the Vasa mast is just not really a good example of his proposition? If it applies, maybe just to a minor degree. Of course, his article was written over half a century ago and research has moved on since, especially on the Vasa I would suspect, as it was freshly recovered at the time. What do you think of his other examples? To me they seem to be more pronounced examples (compared to Vasa's mast) gathered over 30 years (as he describes it). Physical contemporary evidence, albeit interpreted and sometimes of not entirely reliable sources (though apparently multiple sources). Do you know if the mast of 'Gröne Jägaren' survives? Other contemporary Swedish built masts salvaged from wrecks? However, his drawing of the Vasa mast seems very accurate and portray this 'shoulder' pretty much as in the newest Vasa drawings, so could his earlier examples be considered just as carefully portrayed? Also interesting is that in the votive ship designs he refers to; again, as with the Vasa, the cap is rounded but with sheaves for the ties below the top. There may be photos and drawings of these votive ships prior to and during conservation, total of 55 votive ships. I think Svensson was a very good observer of detail, and very knowledgeable, so I would not doubt his drawings or source material. I think he does make a good case for this shoulder in models, and will have to trust him on the Gröne Jägaren masthead until I can find it in the magazines. I think Vasa is a poor example, since the shoulder is too small relative to the diameter of the shrouds and there is evidence of a bolster. You are correct, the bolster is close to 18 inches at the wider end. For the shoulder to work, it needs to be wide enough that the shroud will not slip over it as the rope or wood compresses under load. This depends on the slip angle (the angle between a tangent to the rope diameter and the angle of the shoulder at the point of contact) and the compresibility of the materials, as well as the load, but it should be possible to calculate it. The general rule in rigging is that a load bearing shoulder needs to be half the diameter of the rope to be secure. On Vasa, the "shoulder" is just two points at the corners, where the mast starts to make the transition from square to round, and does not go all the way around the mast. This offers very little surface area, so concentrates the force on the corners, which would then tend to bite into the rope and chafe as the mast works - a bad arrangement. The other shoulders that Svensson cites are made differently. The combination of rounded, Dutch-style cap and English style sheaves in the hounds is not unique to Vasa. It may be a more generally Swedish solution, as some of the models suggest. Vasa's rig probably represents the accepted standard for the Navy Yard rather than any departure from the norm, and there a number of other mixed features in the rig. The basic proportions of the rig (mast location and lengths, for example) follow English rather than Dutch practice. This may represent older traditions, or it could be a result of the combination of a large number of Dutch workers in the yard with a rigging supplier from Scotland. Concerning Svensson's reports on votive ships, those are manuscripts in the archives of the maritime museum here in Stockholm. It may be possible to order copies, although I cannot guarantee that. They are probably conservation reports to a large degree. Thanks for that very interesting reply. There sure are a lot of influences in both directions between Scandinavia and Scotland. Perhaps this is one of many? Ropes over caps only on lower fore and main by the look of it. I haven't really looked at Dutch rigging, perhaps this is normal? It's not mentioned in RC Andersons book of rigging.